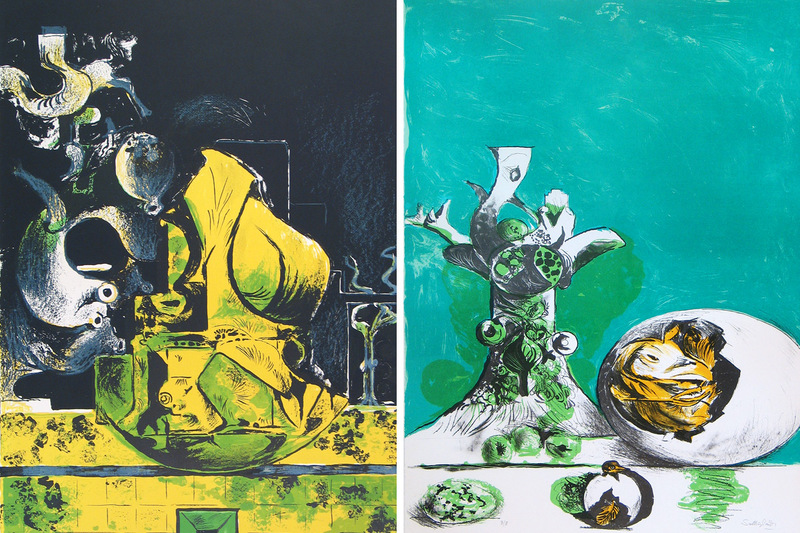 A versatile technician and an artist of intense personal vision, Graham Sutherland is widely considered one of the most important British artists of the 20th century. 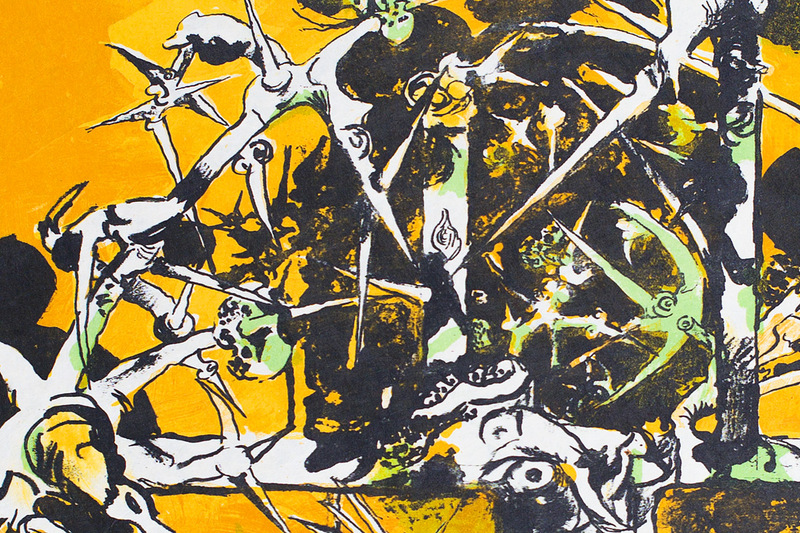 In addition to his extraordinary contribution to portraiture, public and religious commissions, and a much-lauded career as a painter in oils, Sutherland dedicated six decades of his life to printmaking and graphic design, resulting in a legacy of work that, despite its breadth, retains a powerfully unique voice. Born in 1903 in Streatham, Sutherland’s considerable artistic talents were first realised at Goldsmith’s School of Art (1921-26) where he quickly became a highly skilled etcher. As a young boy he had spent his years immersed in natural history and geology, closely observing, sketching and absorbing the natural world while on countryside holidays and family outings. Encouraged by the Goldsmith’s head, an established etcher himself, these early sources of inspiration and his developing draughtsmanship were put to proficient use. Sutherland soon specialised in engraving processes, particularly etching, and devoted himself to mastering the required techniques. 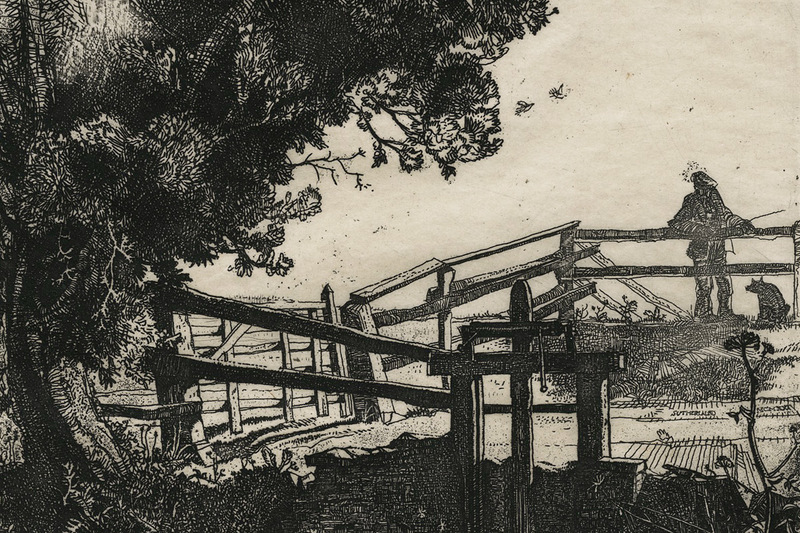 In 1923 his first prints were published, swiftly followed by a one-man-show in 1925, the same year he was elected an Associate of the Royal Society of Painter-Etchers and Engravers at just 22 years old. 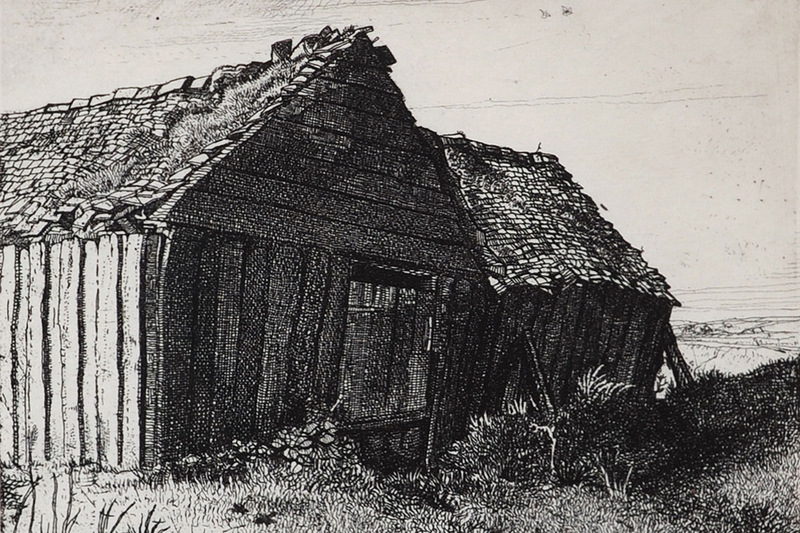 Early influences included the mystic, Romantic landscapes of the visionary artists William Blake and Samuel Palmer and the idyllic etchings of Whistler, with bucolic scenes of cottages and dilapidated farm houses sat amidst overgrown hedgerows. 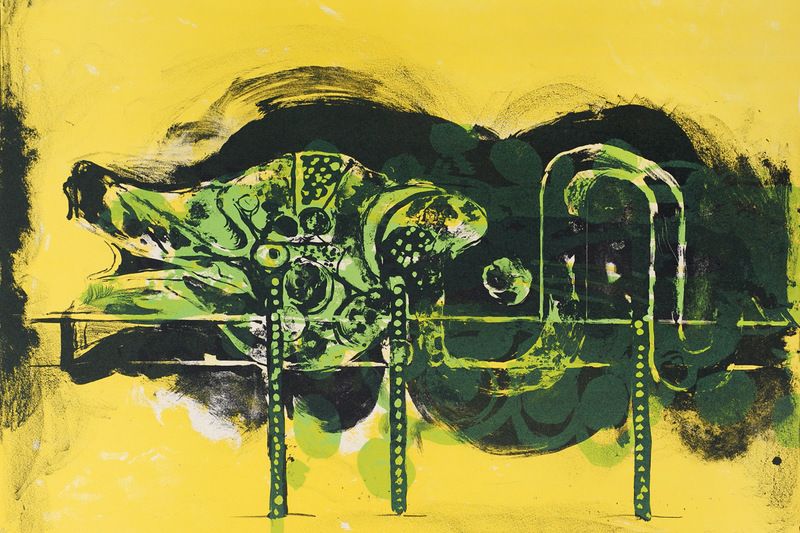 Now recognised and regarded for his work, Sutherland was also offered a teaching position at the Chelsea School of Art, instructing students in engraving and etching whilst developing his own graphic style. In 1929, however, the demand for prints of every kind declined dramatically in the catastrophic aftershock of the Wall Street crash. In the subsequent global economic depression of the early 1930s, Sutherland turned to painting, ceramics, graphic design, and other varied commercial work in order to earn a living, including the well-known poster designs for Shell petrol and the London Passenger Transport Board. The sheer variety of projects open to him, coupled with the fresh discoveries of oil painting and the verdant landscape of Pembrokeshire, contributed to a powerful, personal artistic style that emerged and developed in the pre- and post-war years. Throughout the 1930s Sutherland began experimenting with lithography, a medium well suited to his love of drawing and to which he would return frequently in his later years. With the outbreak of World War II he was made an Official War Artist from 1940-45, his appointment and the paintings he produced during this time of bomb-damaged streets in the London Blitz spurring on his artistic career as his work became more widely circulated. In the late 1940s important religious commissions followed, including the large Crucifixion (1946) for the Anglican church of St. Matthew in Northampton, as well as the critically acclaimed portrait of the writer Somerset Maugham in 1949. The success of Sutherland’s public commissions was instrumental to his growing reputation as an artist, though as he soon learned this renown brought highs and lows in equal measure. Commissioned to produce what is perhaps his best known work, the enormous tapestry Christ in Glory (1962), for the rebuilt Coventry Cathedral after its destruction in the war, Sutherland’s vast installation represented a profoundly personal endeavour to the artist who had converted to Roman Catholicism back in 1926. By contrast, at the public unveiling of his infamous portrait of Winston Churchill to an audience of thousands in 1954 the completed work was openly mocked by Churchill before being destroyed by his wife some years later. Archive footage of the unveiling shows a seated Sutherland writhing in discomfort in the background as the laughter of the audience, ignorant of his presence, rings through Westminster Hall. 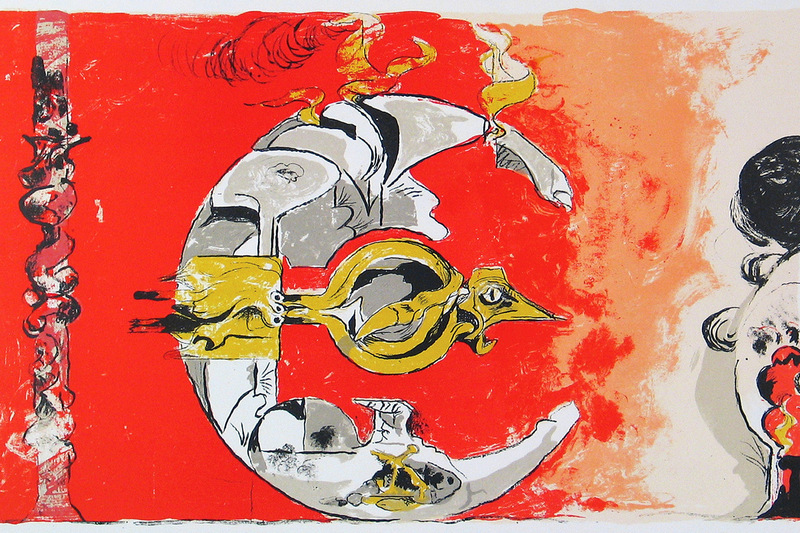 By the 1960s printmaking, and especially lithography, returned to Sutherland’s focus in full force. 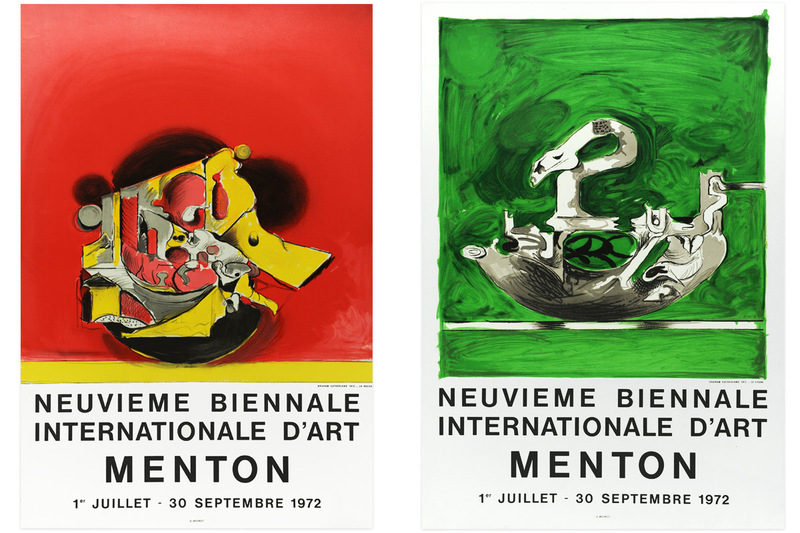 During these last few decades of his life he produced almost three times as many prints as he had in the first half of his career, experimenting with ever more vivid uses of colour and form. 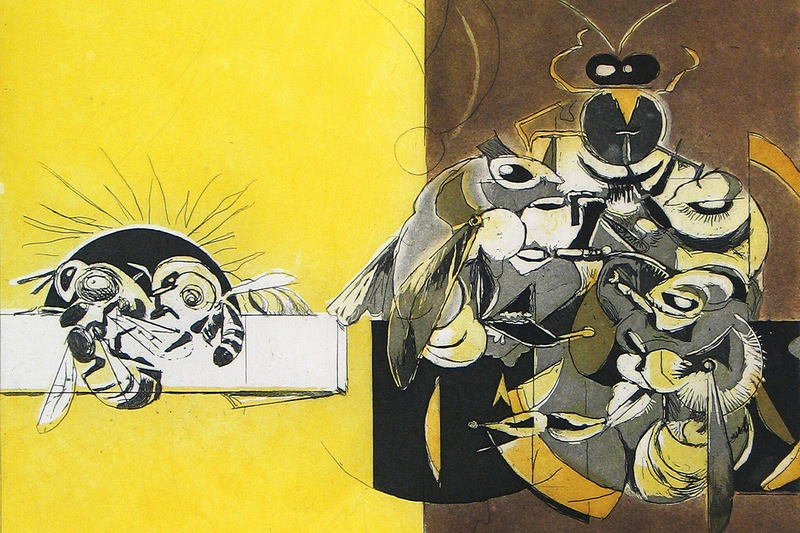 As well as new subjects, such as the birds, beasts and insects of his Bestiaries and the famous Bee suite of lithographs, landscapes and natural objects such as trees, rocks, and root formations were subjected to greater distortion and abstraction. Sutherland’s description of the ‘transforming’ landscape echoes the changing nature of his own work. Natural forms of growth such as tree roots and thorn bushes are frequently depicted close up or from foreshortened viewpoints. These organic, biomorphic formations curl, bulge and burst their way around the page, every mutated branch or totemic rock lent a powerful sense of life. Sutherland’s work of this time is almost animistic; even dead trees, sprouting shrubs and unmoving stones seem to possess a living, breathing spirit. Sutherland returned to Pembrokeshire for the last time just a month before his death in London in February 1980. Despite numerous retrospective exhibitions devoted to his work, both at home and abroad, during the last two decades of his life, his impact on British post-war art has only recently come to serious critical attention. As haunting as it is enlightening in its depictions of landscape, his art is not easy; yet it must rank among the most expressive and evocative that this country has produced.